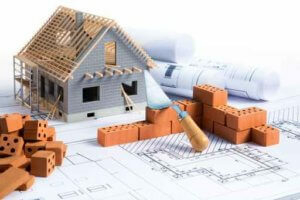 Due to popular demand, I’m going be writing more and more articles referencing some sort of construction and my experience with it in the real estate industry. Because of this, I’m going to have a new category and page where you can find all of these construction specific articles on my website tetonrealtyblog.com – “Know Your Home”. Recently, a past client of mine who purchased a beautiful piece of land in Snow Crest Ranch wanted to sit down with me to get my opinion on construction methods. I assumed this would be for resale value or potential rental income with respect to a layout and design, but we talked more and more about construction methods and my personal opinions there. One of the topics was cold roofs, and their importance in Teton Valley. To be clear, not all contractors, people, or Realtors believe cold roofs are a good solution, so take my advice with a grain of salt, and make sure to consult with your architect and/or contractor. First, what is a cold roof? A cold roof is basically a roof in which the insulation is above the ceiling of the home, but there is an air space between the insulation and the roof itself which is not conditioned or heated space. In most cases, this space is also ventilated to allow airflow between the insulation and the roof. The primary purpose of a cold roof, particularly in our climate, is to prevent ice dams. Because most of the heat inside your home rises and “stacks” along the highest points of the ceilings, much of that heat and the moisture in the air along with that heat finds its way through the roof and into the attic space. Most people don’t realize that even latex paint is not a vapor barrier, it will allow moisture and heat to convect through the drywall and the insulation. If this heat doesn’t have a way to escape before it gets to the bottom of the roof opposite the snow sitting on that roof, it will eventually melt the snow. As the snow melts, that water turns to ice which creates ice dams, those gigantic icicles hanging from your roof eaves. Once this begins to happen, ice can freeze up and under flashing, and creep into areas it’s not supposed to be, often causing leaks on the inside of your home. There are other benefits to a cold roof, such as ventilation. As I had mentioned above, often times that warm air carries some of the moisture inside the home along with it. These ventilated spaces between the insulation and the roof allow this humid air to dissipate. Depending on the style of construction, cold roofs are easier to achieve with some types of roof systems than others. For example, if you are planning on flat ceilings with vaulted ridgelines, you’ve got plenty of space for an unconditioned attic, adding vents in the soffits and along the ridge is an easy task. However, you might be building a shed style roof or perhaps your ceilings are vaulted inside to match the roof lines. In these cases, it can be difficult to achieve the required R-value if you reduce the thickness of the insulation to allow space for ventilation. One consideration here would be to use closed cell spray foam which has a higher R-value per inch. If you do this, make sure you work closely with your contractor and insulator to make sure that the foam is thick enough and the proper vapor barriers are in place as not to cause condensation problems.